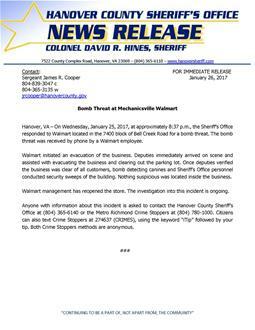 Hanover, VA – On Wednesday, January 25, 2017, at approximately 8:37 p.m., the Sheriff’s Office responded to Walmart located in the 7400 block of Bell Creek Road for a bomb threat. The bomb threat was received by phone by a Walmart employee. Walmart initiated an evacuation of the business. Deputies immediately arrived on scene and assisted with evacuating the business and clearing out the parking lot. Once deputies verified the business was clear of all customers, bomb detecting canines and Sheriff’s Office personnel conducted security sweeps of the building. Nothing suspicious was located inside the business. Walmart management has reopened the store. The investigation into this incident is ongoing. Anyone with information about this incident is asked to contact the Hanover County Sheriff’s Office at (804) 365-6140 or the Metro Richmond Crime Stoppers at (804) 780-1000. Citizens can also text Crime Stoppers at 274637 (CRIMES), using the keyword “iTip” followed by your tip. Both Crime Stoppers methods are anonymous.